As a caravan owner you will proud of your van and want it to look its best. At the end of the season its time to put it away for the winter. You know about winterising the van to ensure its not affected by the cold but what about the carpets and soft furnishings. Over the season its likely that they have had a fair amount of use and been exposed to all sorts of stains and spillages. Do you want to leave the remains in place over the winter? 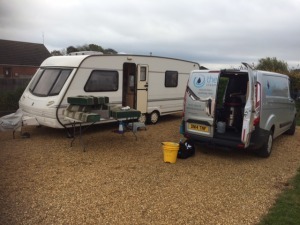 At The Rutland Cleaning Company we are keen caravanners and understand their construction and idiosyncrasies and are therefore ideally paced for all your caravan cleaning needs. We use specialised pH neutral cleaning solutions that deal with all organic stains and spills and leave your carpets and upholstery clean and fresh and at the same time deal with all bacteria and viruses that may be within the fabric.